Like so many paths to hell, my road to kombucha addiction was paved with good intentions. I started hanging out with some cool girls. They grew vegetables and raised chickens. They composted and crafted. I wanted them to like me. When one of them led me to her pantry and lifted the cheesecloth from a vintage wide-mouth candy jar of aging kombucha, I recoiled. It looked like snot and smelled like kimchi soda, but I wanted to fit in. I took a sip. I tried not to inhale. Soon I was breaking bad with my own kombucha operation. “What the hell is that?” my husband asked, while searching for mac-and-cheese in the cupboard. He was referring to the gelatinous ectoplasm of “mother,” a symbiotic colony of bacteria and yeast (SCOBY) that transforms tea and sugar into kombucha, a beverage hailed for its dubious immune-boosting properties. 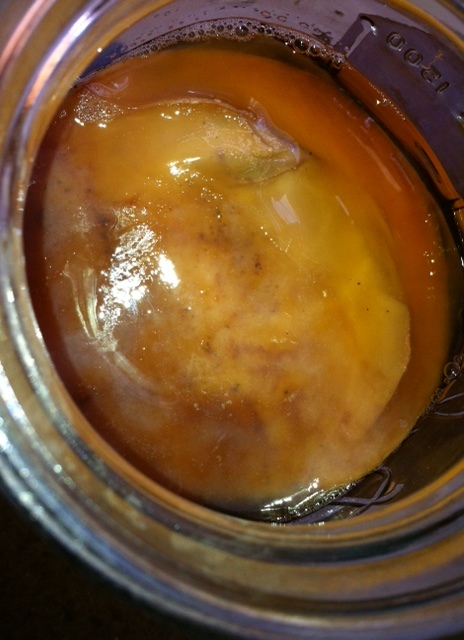 SCOBY is one ugly mother, like a cross between a saline breast implant and placenta. Some people refer to it as a mushroom, others as jellyfish. It’s probably that association with sealife that makes “Moby” a popular name for SCOBY. “How long will it be here?” he asked, backing slowly away from the oversized Mason jar. He prepared the noodles in silence. He has learned—from the chickens in our backyard and the terrarium of salamander and crickets in our bathroom—that there’s no arguing when I set my mind on an ecosystem. Kombucha is indeed an ecosystem: Yeast feeds on sugar, transforming it into alcohol, which bacteria ferment into acetic acid. It takes about ten days for the magic to happen, after which you drink the kombucha and start a new batch with the mother. In this endless cycle, kombucha is like sourdough, which can yield infinite generations of bread, so that millennia from now a piece of space-age toast could trace its roots to a single loaf my grandmother baked. It makes me wonder what might have happened if Jurassic Park author Michael Crichton had turned his science fiction toward kombucha instead of petrified amber and the dinosaur DNA therein. Depending on what reports you believe, Fermentation Park could be amply terrifying, since kombucha can be fatal. Again, depending on whom you believe. When it comes to risk-reward analysis of kombucha, the literature is about as straightforward as the Federal Reserve Board prognosticating about interest rates. On the one hand, rates could rise; on the other, they could fall. Kombucha research has its own variation of FedSpeak: On the one hand, kombucha might cure cancer, arthritis and irritable bowel syndrome; on the other, it might kill you in a single swallow. And still, such a spell kombucha has cast on me that every ten days I add a pot of sweet Darjeeling to the Mason jar, then sit back and wait for the symbiotic symphony of scum to yield a festive fermented fizz. That is, until recently, when a family vacation set me behind in my manufacturing. I wasn’t home to tend the ’buch, and the liquid evaporated, leaving the mother protruding above the surface like a dried, shriveled oyster. When I looked closely, I thought I saw a pattern of dots—spores, possibly?—scabbing on the surface. Research on kombucha is clear about one thing: Don’t truck with moldy mother. But were these tiny carbuncles actually mold? On the one hand, I didn’t want to euthanize a perfectly good SCOBY; on the other, I didn’t want to risk a nanobattle of microorganisms in my colon. I emailed a photo to a friend whose mother shared bloodlines with my jellyfish. “Do you think it’s mold?” I typed with trembling fingers. In minutes, she was in my kitchen, probing in the Mason jar with a fork. It didn’t look good, so we bowed to the prevailing Internet wisdom: When in doubt, we threw it out. “I’ll bring you some of my SCOBY,” she promised, as Moby slid down the garbage disposal. I felt sad and a little guilty. Maybe we should have buried him? Meanwhile, she put the kettle on and made a pot of scum-free Earl Gray. We sat at the kitchen table and talked about our mothers until it was time to get the kids from school. Even without the stench of vinegar and the slime of SCOBY, a cup of tea and conversation made me feel better. It’s enough to make me think that friendship—not fermentation—is the real value of kombucha.